The heavily revised Land Rover Discovery Sport, likely to be revealed by early 2019, will get a heavily updated platform to deliver much-improved ride comfort, greater boot space and room for underbody lithium ion batteries for new hybrid models. 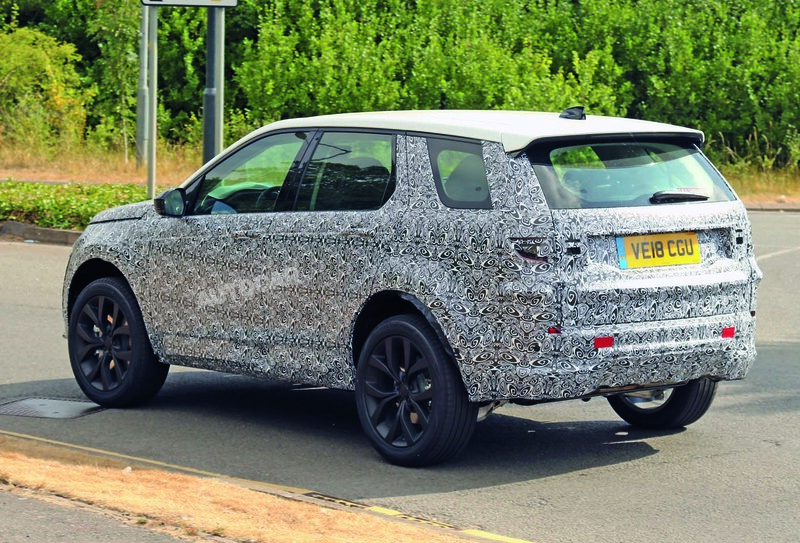 First reported by Autocar in July, Land Rover is ramping up testing of its facelifted Discovery Sport, as these latest spy shots show, as it readies for launch next year. The addition of hybrid drivetrains is the key development for the Discovery Sport’s future. Although details are still scarce, the range-topping hybrid line-up will use a new three-cylinder Ingenium engine coupled to an electric motor/transmission. The 300V plug-in version has lithium ion batteries mounted under the central floor section and could have CO2 emissions as low as 45g/km. There is no news yet on whether the cheaper mild-hybrid models will use electrified turbochargers or a belt-assist starter/generator, but both will be essential offerings as diesel comes under further scrutiny from legislators. Jaguar Land Rover’s bestseller – like its Halewood stablemate, the Evoque – will be built on a significantly updated platform called the Premium Transverse Architecture (PTA), which is notably stiffer than the current D8 platform. Small revisions to body design is said to have reduced wind noise and cut drag by around 10%, helping to improve cabin refinement. Also promised is a “40% better” throttle response thanks to a newly engineered engine mount design and transmission. The new electrical architecture allows a projected virtual reality view of the ground obscured by the car’s nose and a new “smart rear- view mirror”. The reworking of the interior and exterior remains secret but Discovery-series brand values call for “versatility, intelligence and breadth of capability” so expect a more rugged exterior treatment with less resemblance to today’s Range Rovers. Another possibility is a notable improvement in interior quality and design, as its sophisticated Volvo XC60 rival is selling extremely well. In March 2018, 16,227 XC60s were sold worldwide, compared with 14,671 Discovery Sports. By June, monthly XC60 sales had soared to 19,534. In the first four months of 2018, Discovery Sport sales fell 18% compared to the same period in 2017. Will be interesting to see what the actual range of the PHEV Disco Sport aswell as what other compromises there will be-I.e reduced boot space, extra weight, affect on handling, smaller fuel tank. Oh and price! I assume the claimed range is NEDC so in reality it will be lot less. Still with Disco Sport, Evoque, XC40 and more PHEVs the Outlander will probably start to feel the heat. That car broke down on the A5 near MIRA on Tuesday morning. There was lots of premium head scratching going on under the bonnet. Not all suprised. My dad has a DS with 'excellent' new ingenium enegine and it is a pile of crap. Been in the garage no end of times which is painful in itself as the delaers are so useless. Gearbox clunks alarmingly, step-off is dangerously hesitant (gearbox been reprogrammed numerous times), wheel bearings been replaced, boot seal failed and so on. I was speaking to an AA driver who says they have the contract for Land Rover breakdown and he said it keeps them more busy than anyone else. In my opinion Land Rover have nailed the deisgn so they sell well, but they are poorly engineered/built and dont give damn in the aftersales. Thought it might be hand back job if it was that bad and the Garage could not fix it?, outside the time to hand back..? This is a positive development for JLR. Let’s hope the new drivetrain lives up to expectations as on paper it looks good - more efficient petrol power with zero-emissions capability and low end torque needed for a heavy car. Don't make such an unnnecessarily heavy car in the first place. In complete agreement with that. I think the Jaguar E Pace is heavier than the F Pace, which itself is hardly a light car. JLR’s entire fleet is much too heavy. My sons Seat is lighter and hence flimsy,curbed a wheel in the snow and bent track trod end so weak and light compared to a Land Rover. That comment is comedy gold. I agree it's not all that simple. A Land Rover needs to be offroad tough, that means heavy, a Jeep Wrangler for example comes in at over 2 tonnes. I appreciate there are ligher SUV's but they tend to be made by companies that don't expect their owners to offroad.